A groundbreaking album, featuring a contemporary view on different grooves, chants, voices, poems and folklore. 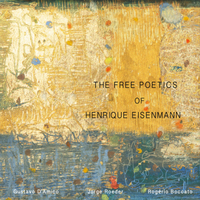 Opposing the idea of aeesthetics, which deals essentially with the rules governing a piece of art, poetics emerges with a young vigor, irreverent, dreamy; it's the raw essence behind a piece of art; the purpose, the fresh energy that allows art to free itself and fly opening new paths; a praise of freedom. This album features pieces composed from the most different materials: rhythms, chants, voices, poems, animals and folklore. Still, the purpose behind them is the same: to sculpt a voice of artistic liberty that celebrates imagination, affection and the joy of making music together.